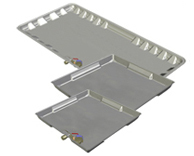 AquaGuard secondary drain pans are engineered to be the strongest and most versatile pans available for those who desire a truly professional HVAC installation. AquaGuard premium pans utilize DexElar® to ensure every pan is crack resistant and over two and a half times stronger than typical plastic pans. DexElar® is an incredibly strong and resilient material that can withstand extreme temperatures (-40 ºF to 260 ºF). All AquaGuard brand secondary drain pans include an AG-4000 series float switch system. Pans meet or exceed all international product building codes and are UL approved. DexElar® material is UL-94 5VA and ASTM E-84-05 compliant.